Clear cut communication between different domains in an Enterprise has always been a problem. To overcome this problem in architecture, ArchiMate was introduced. 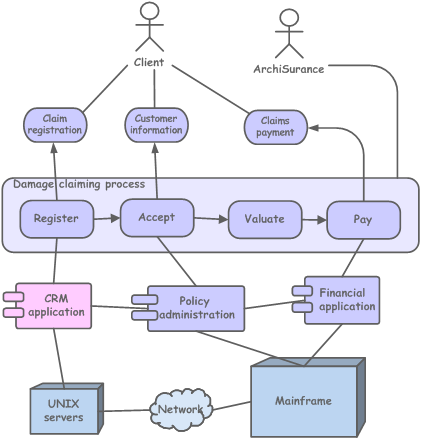 But what is this architecture language exactly and how does it help business and IT to communicate their architectures? ArchiMate is claimed to be an open and independent enterprise architecture modeling language to support the description, analysis and visualization of architecture. With ArchiMate you do not get in-depth domain specific modelling solutions, but you get just enough to communicate the essentials of architecture across domain borders. And for that it works perfectly. With it you can create business models, application models and technology models and create cross-overs, all based on the ArchiMate meta model and CRUD-matrix (the rules and constraints for connecting entity classes). 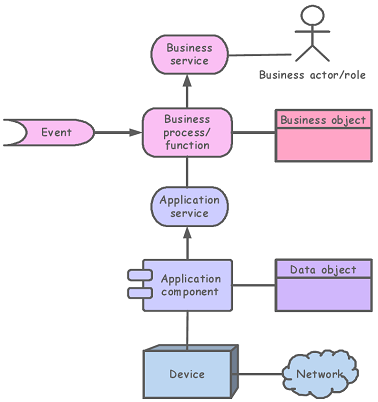 For example for business managers you can create a process application dependency view, showing in a simple way how now or in the future the business activities* in business processes are supported by applications. And how that blocks or enables the company’s strategy. In this way you make business managers more aware of the fact that continuity in business processes depends a great deal on perfectly working software applications. In ArchiMate there are diagrams defined on how to visualize views of the models for specific stakeholders. The modeling language holds a set of predefined symbols for the recognized entity classes in the meta model. It also has a predefined approach for extending the language in a structured way with your own concepts or to use stereo typing for existing concepts and symbols in the ArchiMate language. Model anything out of the box. It is a common misunderstanding that you can model anything with ArchiMate. That is not the case. For that, you really need to extend or alter it yourself. But when you have modeled anything in another language, say UML or BPMN, you can communicate the essence with ArchiMate into another domain. Complete set of modelling rules and conventions. If you want to use it in practice you need to define a large set of rules with naming conventions for entities, for subclassing and for typing entities, so everyone does it in a similar way and the ArchiMate models and views stay inter-operable. Common types are present. If you use ArchiMate as a single language to model architecture in, you have to extend the language a great deal yourself. For instance with types for processes (business processes vs work processes or management processes, operational processes vs supporting processes) and for applications (common software applications, shared software applications vs specific software applications or business software applications vs office automation software applications). Definitions do not differ. Another misunderstanding is that ArchiMate 2.0 / 2.1 and 1.0 do not differ that much in definitions. Well, they do. So it is very important to clearly agree upon and communicate the version that is used in an organization. The benefit of all the things not present in ArchiMate is a light-weight modeling language to excel in cross-domain modeling. ArchiMate had its own original logo before it was handed over to The Open Group. That logo is used on this page. *) Business Activity did not make it to the ArchiMate specification 1.0 or 2.0 at the Open Group, although it was there before. Maybe because to make ArchiMate as lean as possible. Do you want to create ArchiMate models yourself?